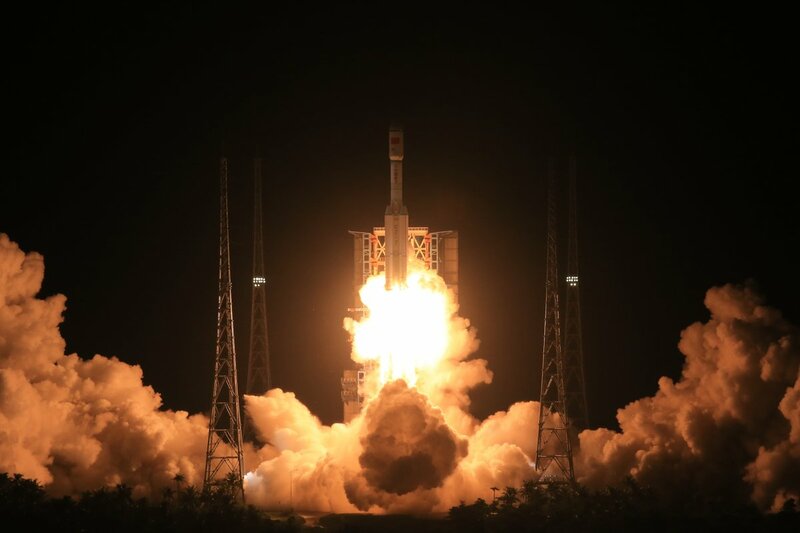 The 53-meter tall Long March 7 lifted off from the Wenchang Satellite Launch Center at 12:00:07 UTC on Saturday, ascending into the night skies over Hainan Island to mark the grand opening of China’s first sea-side space port. 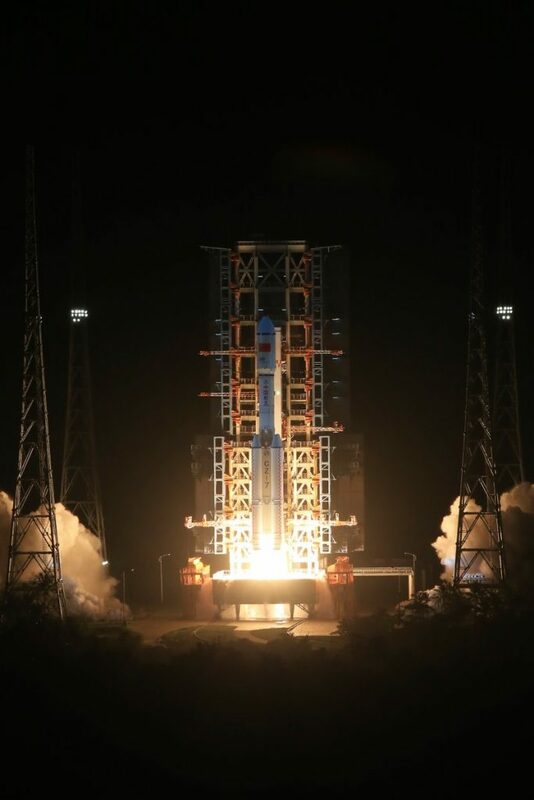 Long March 7 – to become China’s workhorse launcher – headed uphill under the power of six YF-100 engines – one on each of the four strap-on boosters and a pair on the core stage – generating a total thrust of 722 metric tons. The four boosters dropped away 174 seconds into the flight and the core stage finished its job 16 seconds later, separating from the second stage which then lit its four YF-115 engines to deliver 73,400 Kilogram-force of thrust. Payload fairing separation was completed at T+3 minutes and 33 seconds when Long March 7 had departed the dense atmosphere. Separation of the payload stack occurred ten minutes and three seconds after liftoff, marking the beginning of a complex mission for the Yuanzheng-1A upper stage, tasked with deploying a number of small satellites, shepherding the scaled prototype of China’s future crewed spacecraft around the planet for nearly a day, and demonstrating the capabilities of the new upper stage. Yuanzheng-1A is a modified version of the YZ-1 upper stage flown for the first time in 2015. It can operate for up to 48 hours instead of 6.5 hours for YZ-1 and features improved navigation and control capability, thermal control systems and orbit-planning systems to support the longer mission duration. Also, it can deliver multiple payloads as opposed to the single payload deployment possible with YZ-1. The YZ-1A upper stage can support many re-starts of its 6.5-Kilonewton engine, possibly up to 20, allowing it to support the most complex mission profiles. YZ-1A, as flown on Saturday, will build the foundation of future deep space propulsion modules and orbital servicing spacecraft. 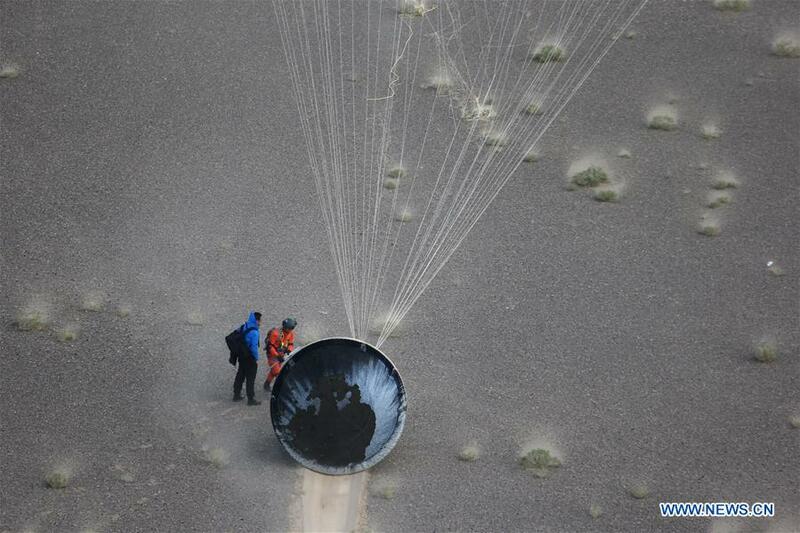 For this demonstration mission, YZ-1A was tasked with a number of maneuvers to release the satellites and deliver the crew capsule prototype to a re-entry trajectory for a landing demonstration. Eight objects were tracked in three different orbits by the Joint Space Operations Center. Two objects in a 287 x 380-Kilometer orbit inclined 40.8° likely represent the Star of Aoxiang satellite and the YZ-1A upper stage and payloads stack after the 1st upper stage burn. Four objects in a 200 x 380 Kilometer orbit most likely correspond to the Aolong-1 satellite, the second stage of the Long March 7 rocket, the satellite dispenser and the YZ-1A upper stage support structure. Finally, four objects in a higher 200 x 555-590-Kilometer orbit are probably motor separation covers that usually occur with Long March 2 series launches. 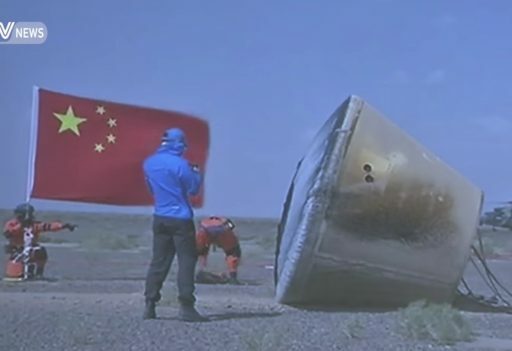 The prototype of China’s Next Generation Crew Vehicle flown on this mission was 60% the size of the real spacecraft. The scaled vehicle measures 2.6 meters in diameter and standing 2.3 meters tall with a total mass of around 2,800 Kilograms. 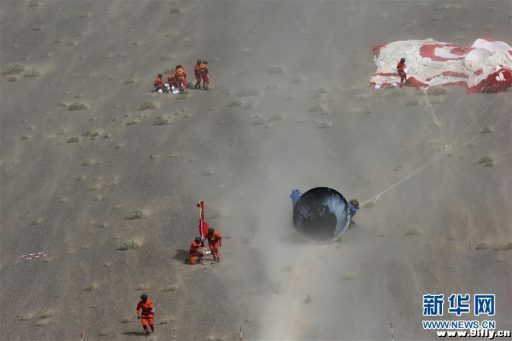 The crew capsule was placed on a sub-orbital trajectory by the YZ-1A upper stage early on Sunday, setting up a re-entry towards a landing in Inner Mongolia. After separating the capsule, YZ-1A again lifted itself onto an orbital path to continue its demonstration mission. 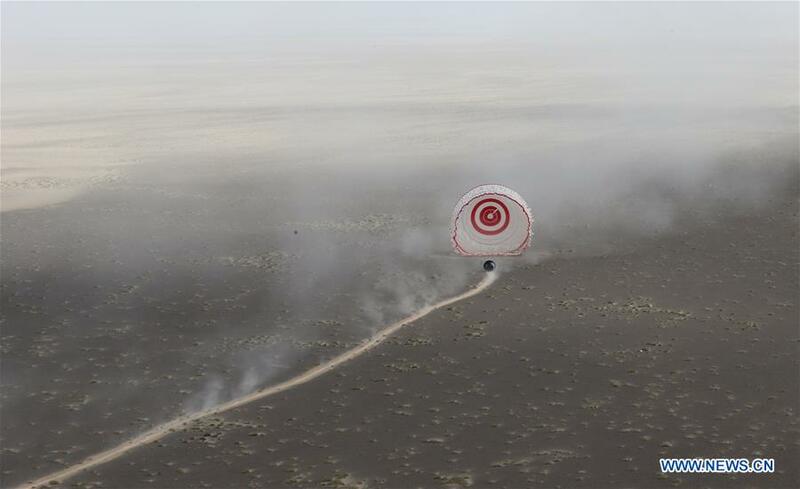 The prototype vehicle’s primary mission was to collect aerodynamic and heating data during re-entry to verify key technologies including a re-usable ablator heat shield and a lightweight spacecraft structure. Also, the vehicle was outfitted with a new type of antenna to be able to penetrate the plasma occurring during re-entry to avoid a blackout in communications. 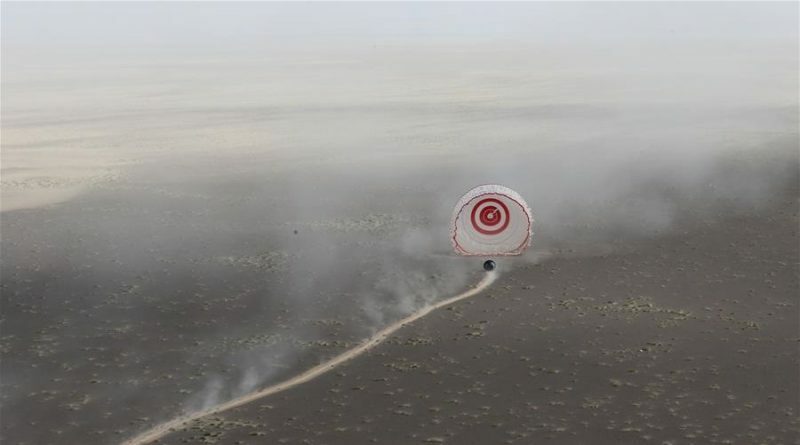 While re-entering, the vehicle collected a vast amount of data with temperature, pressure and heat flow sensors to permit a full assessment of the heat-shield’s performance. Coming up on landing, the vehicle opened a Supersonic Stabilization Chute before deploying a Drogue Chute that slowed the craft down for the deployment of the lone Main Parachute to slow the capsule for touchdown in the Badain Jaran Desert at 7:41 UTC on Sunday after 19 hours and 41 minutes of flight time. 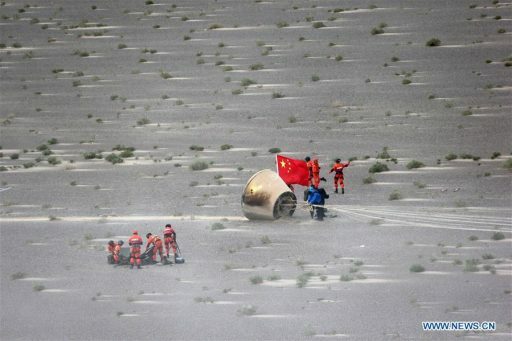 Strong winds dragged the vehicle for quite some distance after touchdown, but the China Manned Space Engineering Office declared the landing a complete success, laying the foundation for continued development work on China’s next generation crew vehicle that will take humans to China’s upcoming space stations and on missions Beyond Earth Orbit (BEO). 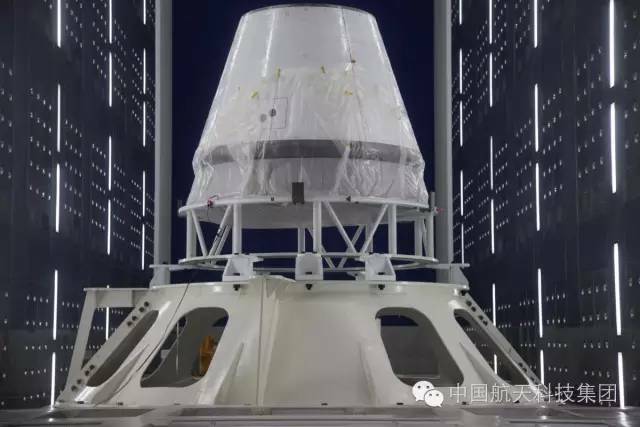 China’s Next Generation Crew Vehicle follows a similar approach to NASA’s Orion spacecraft, using a blunt cone shape for the Crew Module, a cylindrical service module attached to the aft of the Crew Module and a docking port on the forward-facing side. The vehicle will support crews of two to six. Two different versions of the spacecraft will be used for LEO and BEO missions – when traveling to China’s Space Station in Low Earth Orbit, the spacecraft would weigh around 14 metric tons while the lunar landing craft would weigh in at around 20 metric tons using a different Service Module with greater propellant capacity. The Next Generation Crew Vehicle will be able to complete missions of 21 days in Free Flight and remain docked to a space station or deep-space habitat for two years. The primary landing mode of the new spacecraft will be a splashdown in the Ocean near the equator with a land-based landing still available as a backup. Sunday’s landing experiment will deliver the data needed to verify the performance of the heat shield during high-speed re-entries when coming from missions to the Moon or beyond. The test also delivers valuable data for an assessment of the entry profile and guidance-related aspects. The China Aerospace Science and Technology Corp. declared Sunday’s test landing a full success, building a solid foundation for continued development of the new vehicle. While the entry vehicle made its way to Earth, the YZ-1A upper stage continued operating, conducting its fourth main engine burn to lift itself back into orbit for another day of operations – demonstrating it can support extended missions. According to media reports, the YZ-1A upper stage was to continue orbiting until around 7 UTC on Monday when a propulsive deorbit maneuver was planned to remove the stage from orbit for destructive re-entry, marking the completion of a complex mission. Aolong-1 is a small satellite tasked with a demonstration of orbital debris clean-up by means of a robotic arm capable of grabbing debris objects and launching them on a trajectory intercepting the atmosphere. The Star of Aoxiang is the first ever 12U CubeSat to be launched, measuring 20 x 20 x 30 centimeters in size and hosting an experimental payload testing polarization-sensitive optical navigation outside the atmosphere. A pair of Tiange satellites were aboard the vehicle to complete a test of space-to-space communications. The YZ-1A upper stage also hosted a ballast mass to simulate the mass properties of the Tianzhou cargo spacecraft which will become the first regular user of the Long March 7 rocket. An attached payload on the YZ-1A upper stage was to demonstrate the feasibility of fluid transfer in orbit to prepare YZ-1A for a possible future application in satellite servicing missions. 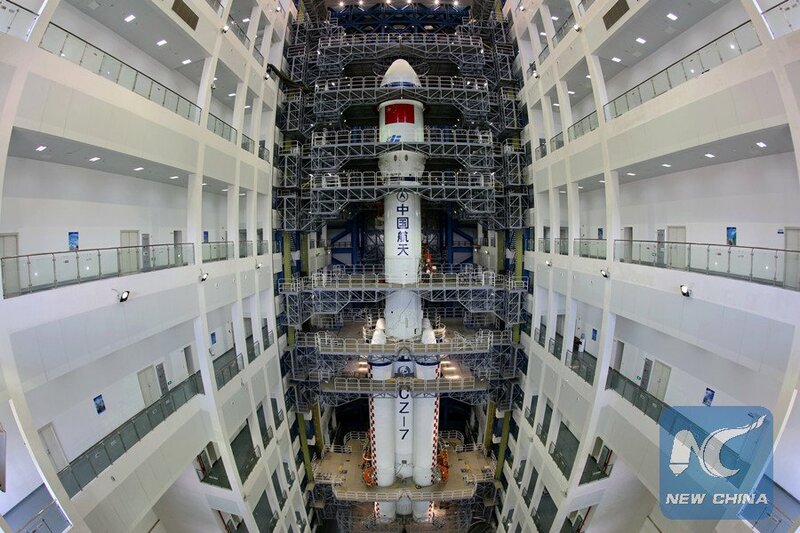 Long March 7 – holding the rank of China’s most powerful rocket until the Long March 5 begins flying – will make its next launch in the first half of 2017 when lifting the inaugural Tianzhou cargo vehicle to the Tiangong-2 space lab. 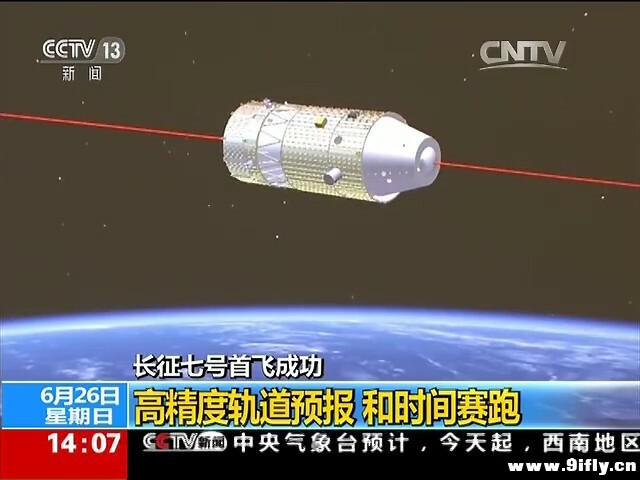 Tiangong-2 is currently aiming for launch atop a Long March 2F in September to become China’s second space laboratory – a miniature space station comprised of only one module weighing around 8,500 Kilograms. The ‘Heavenly Palace 2’ will be visited by a crew of two in October as part of the Shenzhou 11 mission that will set the record for the longest Chinese spaceflight to date with a planned duration around 30 days. 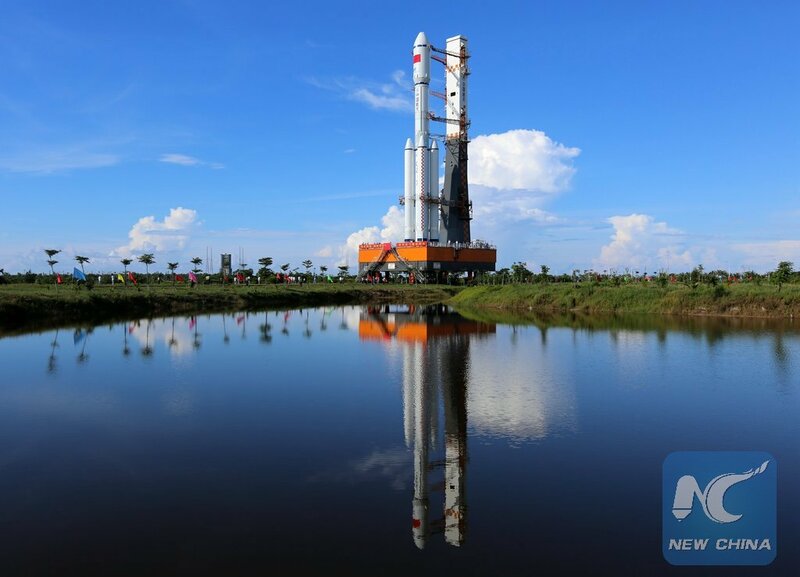 Long March 5, China’s new heavy-lift rocket, will make its debut later this year. Launch was initially promised around September/October, but now appears to be slipping to November. The new line of launch vehicles, CZ-5, 6 and 7 marks a major switch in rocket technology, to succeed China’s antiquated rockets that consume a toxic and expensive hypergolic propellant mix and are not nearly as powerful as the new Kerolox/Cryogenic launchers. Once the new vehicles have established their reliability records, China will phase out its heritage vehicles, though Long March 2F is expected to support the crewed space program until later in the next decade.